Brown’s Drug Store, Duncan, MS; Photo courtesy of MissPres reader gstone. Thanks to gstone for the photograph of the Duncan Drug Store, closed since 1965. Try as I might, I have been unable to locate any information about the store. I am sure if you are of a similar age some of us, you have fond memories as well or those marble fronted soda fountains. There are even a few of them still preserved here and there across the US. And, earlier in the series, I mentioned the Duncan High School, and my elation at discovering the building was none other than an E. L. Malvaney designed school. Thanks also to the reference provided by gstone, I could discern from the 1942 photograph that the front entryway has not been as altered as I had originally suspected, albeit, altered. 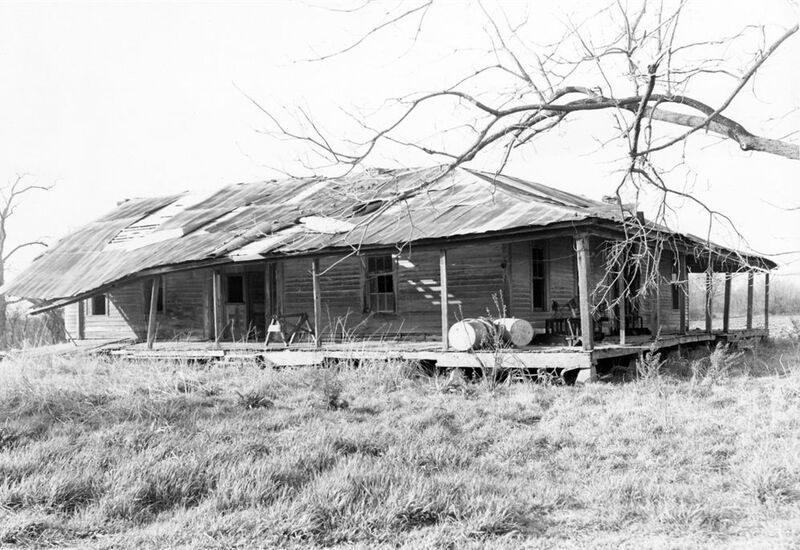 Donelson House, Hushpuckena area near Duncan in 1976. Retrieved from MDAH, HRI database. Photographer unknown. And finally, in the Duncan area, the Donelson House was in serious dilapidation in 1976 and “it may no longer survive” according to the nomination form for the National Register of Historic Places (MDAH/HRI database). In 2012, my students and I made a field trip to locate it, and through the density of the surrounding trees on the creek, we could glimpse only what appeared to be a collapsed roof. If it looked like this in 1976, chances are part of the tin roof is indeed the only thing still in existence. Thank you to all of you at Preservation in Mississippi, readers and contributors, for supporting the preservation of our history in its many forms. Thank you so much for posting our photo of our family drugstore! Emanuel and Mildred would be pleased to know how much we treasure the beautiful things inside the store. It is good to see the Donnelson house too. That style home is still being built today with the wrap around porch and metal roof. If only it could have been preserved. I hope the walls, doors and floors were salvaged and continue to live on in someone else’s home today. Thank you so much for sharing the photograph of the drug store. Do you know where the store was, and how long it operated? I can’t tell you the number of times I went into that drugstore as a girl living in Duncan with my grandparents. My Grandmother ran a general store right down the street from the drugstore, next door to the home of the Gong family and my Grandfather ran a gas station on the corner across from the David Smith family. Love the photos and very happy to see them shared. One correction to this article is the spelling of Donelson. There is only one “n” in the spelling. Thank you, and thank you for the correction on Donelson–I’ll fix it! The layout of the town of Duncan is the same as Lyon, MS, and so many other small North Mississippi Delta towns of that era. A row of stores faced the railroad track. We are so in hopes someone reading this will have better recollection of “downtown” Duncan and remember where the drugstore was in the row. We feel terrible that we did not do a better job of photographing our family history. Suzassippi, we wish to thank you again for your post. We are honored and delighted. Thank you so much; I have been interested in Duncan since my first accidental chance on it. I think one of the great things about the Internet, blogs, Facebook, and social media is the opportunity for us to learn about things we otherwise might not have known, and to connect with people who might know those things. For example, learning about the Fong family, and that one of the surviving buildings in Duncan was once the bank. While I wholeheartedly believe in the preservation of physical buildings and relics, when we are beyond that choice or opportunity, then photographs, oral history, or other things of a similar nature become really important. This drug store was on the corner of the row of stores where Gong’s grocery and home were located. My grandparents had the store next door to the Gong’s home and the garage and gas station on the opposite corner from the drugstore. My grandparents were LQ and Lorene (Rea) McGregor. I have very much enjoyed reading these posts on Duncan. I grew up in Duncan and my parents and brother still live there. They have a wealth of information about the town including Brown’s Drug Store and the Donelson home. I am 85 years old and grew up in Duncan. After serving 5 1/2 years in the USAF, my wife and I moved back to Duncan and still live there. I have a lot of photos of Duncan that were collected in the early 1970s. I can share a lot of information about Brown’s Drug Store & the Donelson House., among other things. I was Kaye Henderson when I lived in Duncan from 1963-1969. My father, Rev. Odis Henderson, was pastor of Duncan Baptist Church then. The drugstore sat on the Southeastern corner of the Eastern street facing the railroad, westerly. There was a double street business district! The drug store sat next to Sing Gong’s Grocery Store. Mr. 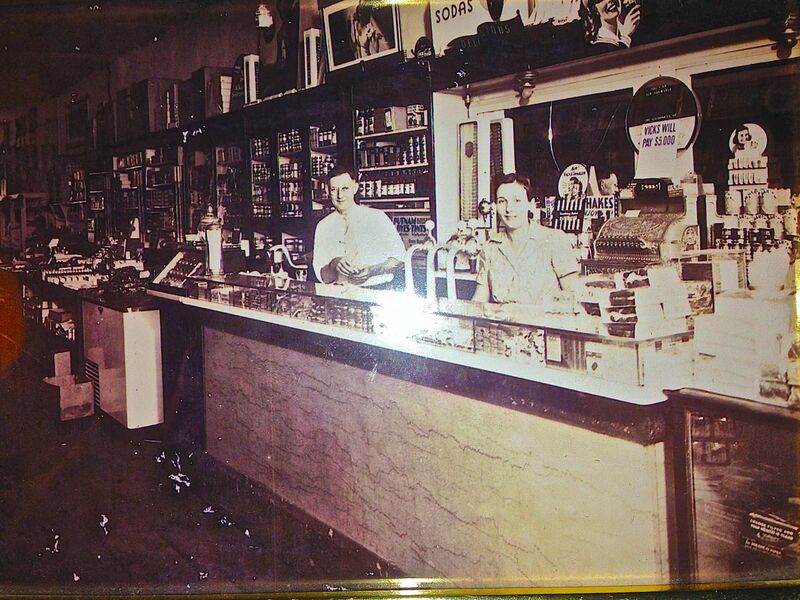 Sing Gong ( Paul) bought the soda fountain and counter for his son, Harry Gong, to have for his pharmacy when he finished Pharmacy School at The University of Mississippi Pharmacy School. I do not know if Harry Gong actually used and moved it, or any of the counters or shelves. They were a beautiful dark wood. I used to go there and buy old fashioned rock sugar candy. It was in large glass jars near the front case and door. We used to go in and look at all of the wonderful apothecary jars. Duncan was a wonderful town. The store buildings and cotton company buildings were intriguging to me as a child. Mr. Tom Boschert Sr., was the Mayor, and Mr. Joseph Jeffreys was the Justice of the Peace. The people of Duncan were, and still are, the most delightful and lovely people. I adored my years there. I wanted to never leave. It was Heaven. There was a tiny little jail, but no crime! Also, I would like to add that when I was there, Duncan School went from First through eighth grades. Mr. John Sherer was Principal, Coach, and Math and Science Teacher. Mrs. Billy Boschert,(Mrs. Nancy), taught. Iano lessons at our Lovely school. While we studied, we heard beautiful classical music ringing through the hallways. It was especially fabulous just before Christmas and in the Spring when the baby grande piano on the auditorium stage had been tuned and opened in practice and preparation for our piano recitals! When I finished the sixth grade the school was soon closed. It tore our hearts out. I still have my sixth grade desk, which my mother, Mrs. Odis W. Henderson, (Mrs. Jewel), then the Chorus and Classroom Music teacher, bought for me when they sold the fixtures. Bayou Academy had Elementary School there for several years. Later it became a wonderful Nursing Home. My Grandfather, Mr. William Odis Henderson resided there for many years. Mrs. T. N. Boschert,(Mrs. Eva Ann), was the Administrator. Thank you, Ms. McCurdy and Mr. Boschert so much for all this great info on Duncan! My husband is Norman Stone, named for his Uncle Norman Brown who was a cotton planter and cattleman there in Duncan. Norman is the son of Emanuel B. Brown, owner of drug store. He contracted polio as a child. Was a man about town in his wheelchair all his life. Late in life married his beautiful wife, Vivian. Yes, I remember Mr. Norman well! I think my father, Rev. Odis Henderson, may have married he and Mrs. Vivian! I remember that she redecorated the house with the greatest and, most tantalizing secrecy! They they gave a fabulous open houses! It was a showplace! She had exquisite taste! He was indeed a man about town! He had a friendly and sparkling wit! Thank you, and I am so glad you enjoyed it! Thank you so much for this wonderful gift, Miss Suzasippi. I had been told that all of the downtown was gone. Your series has been such a relief! Thank you! I appreciate the interest, and comments, of all the folks out there. Maybe in my next career (which involves being an historian and a chef), I can gain some additional first hand knowledge from all the Duncanites who were kind enough to respond and share information. I do hope to get back to Duncan and do some follow up on the historic homes, as well as that “modern blue building” about which Thomas Rosell inquired. A gas stations of Duncan post would be terrific! I thought I spied a little prefabricated metal building on W. Park. I think there are two still standing if I recall correctly. Id also be curious as to when and why the Y & M V RR tracks were pulled up. What a treat it would be for us if you were to be welcomed inside to take some happy snaps of the Norman Brown home to post if it is still occupied. The home is no longer in our family. We hope it is occupied and in good condition as it was, indeed, a very pretty house. Nothing grand, but pretty and comfortable. My mother-in-law was born & raised in Duncan, MS. Her name was Francis Cozette Turner Hughes. Her parents were William & Lorena Turner. Their house was located on the southwest part of town. It was vacant by the time I first came to Duncan in 1977. It was sold in the late 80’s, then later burned down. I still have most of the furniture from the house! The Turner’s owned farm land in Duncan. I’m headed up that way this weekend to take photographs of old buildings in that area. My in-laws (B.B. & Cozette Hughes) lived in Merigold.